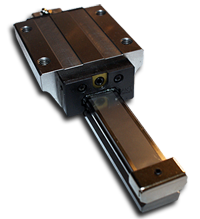 Accu Tech USA offers the largest selection of Linear Guides and Ballscrews in North America. They are committed to providing the smoothest, most precise and longest lasting motion products on the market. Their expert Design Engineering, Application Engineering and Custom Machining services give you the competitive edge you have been looking for. These linear guides have a four-row circular contact design. Four rows of balls are positioned with contact angles at 45 degrees, allowing even distribution of load in radial, reverse-radial and lateral directions. The linear guides can be used in any orientation. Available in Conventional (non-caged) and Caged designs. A range of balanced preload levels provide increased rigidity while maintaining the low friction requirements of stable and high accuracy linear motion. An integrated and patented lubrication distribution system provides effective lubrication regardless of the application orientation. The resulting smooth motion and extended service life ensures reliable and stable linear motion. Accu Tech USA's premium line of ballscrews. Available in External Ball Circulation, Internal Ball Circulation and High Lead configurations. Their superior manufacturing techniques, quality assurance and production efficiencies provide world class ballscrews and the best value in the industry. Unbeatable Precision, Life, Smoothness and Cost. Ballscrew and ballnut are surface hardened to a specific hardness and case depth to maintain high rigidity and durability. Multiple thread starts are available for higher rigidity and durability. Ball circulation tubes (patent pending design) offer smooth ball circulation inside the ballnut. Accu Tech USA has expanded its product offering to offer Linear Actuators and motion control components. 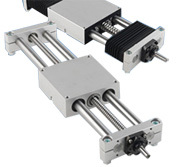 These Linear Motion Actuators are designed to offer low cost motion control solutions for any application. Their precision linear actuators offer the highest accuracy class. 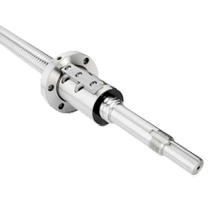 All actuators include ground ball screw assemblies with zero backlash. Accuracy classes include normal and precision class and can be mounted in an X-Y arrangement with custom actuators. Precision Linear Guide bearings offer rigid positioning systems and high repeatability. Custom motor adaptor plates offer infinite motor mounting capabilities. Limit Switches made from the highest quality manufacturers offer various positional capabilities. Clayton Controls is an Accu Tech USA distributor in California. We offer technical support to help our customers solve their applications.